Every year, tens of thousands of people from over 130 countries come to study in Ireland’s universities, institutes of technology and colleges. What’s bringing them here and why are they choosing Ireland? Sheila Power is director of the Irish Council for International Students. She points out that overall statistics for the number of international students are hard to pin down, but says that we need to broaden the conversation out. International students in Ireland come from all parts of the world. There’s a large cohort from within the EU, as well as China, the United States, southeast Asia, India and South America (particularly Brazil). International students primarily come to Ireland for medicine, data analytics, biotechnology, cloud computing and business and finance programmes. They are worth over a billion euro to the Irish economy and the Government here is keen that they have a positive experience of Ireland to carry back to their home country with the ultimate aim of boosting international student numbers to 15 per cent of the student body by 2020. What, in particular, is attractive about study in Dublin? It’s a prosperous, vibrant city that’s much easier to get around in than a large metropolis like London; it has great pubs, restaurants, theatres and regular events; and it’s the gateway to stunning and picturesque rural and wilderness areas including nearby Co. Wicklow. Surprisingly, however, these aren’t the main draws for international students. There are challenges however and it can take time for students to find accommodation, although the international offices are generally good at helping here. 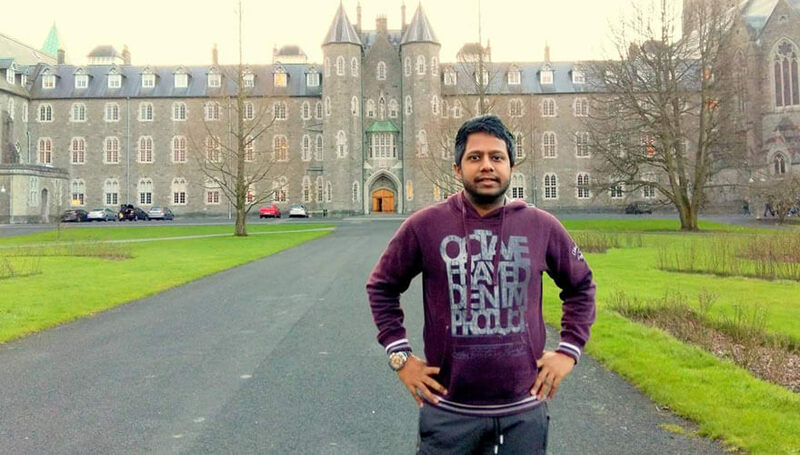 Souvik Roy (31) studied for a masters in electronic engineering in Maynooth University. He is originally from Kolkata in India. “After my undergraduate degree in India from the Dehradun Institute of Technology, I worked in cloud computing. Like most of my peers, I was getting ready for postgraduate study in the United States. But then I attended an event organised by Enterprise Ireland in Bangalore and learned a lot about life here – including the fact that it’s not a part of the UK! I had mixed feelings when I first came to Ireland. I was a mature student returning to learning after eight years of work, it was a whole new country and a whole new culture, and I was worried about how much I was paying to study abroad. When I met my lecturers, however, I was really impressed and there’s no doubt that Maynooth is one of the best places for studying electronic engineering. Last year, I was top of my class and I felt very supported by Maynooth because I knew they valued my work. One of the reasons I came here is because of the people: they are so accommodating and so nice. It doesn’t really matter if you don’t know anyone, because they’ll stop and talk anyway. I also felt there is less racism here than elsewhere. I can pour my heart out to Irish people and there is such a positive vibe. I’ve never felt excluded. Of course, there are problems like anywhere else: accommodation can be difficult to find and postgraduates always have to perform a balancing act between studying and paying their way. I learned a lot about life here – including the fact that it’s not a part of the UK! I agreed to become a student ambassador for Enterprise Ireland because I’ve hugely benefitted from studying here. There are so many brilliant minds in India and a lot of students who want to go abroad for college. The costs are about a third of what you would pay in the US and I think people should know”. Peter McGuire is a freelance features and news journalist. He also works a researcher and editor. He is a regular contributor to The Irish Times and the Huffington Post, and has also written for the Irish Examiner, Sunday Business Post and Irish Independent.